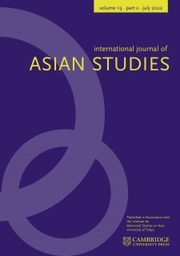 International Journal of Asian Studies (IJAS) is an interdisciplinary, English-language forum for research in the humanities and social sciences. Its purpose is to foster multi-directional communication among the global Asian studies community. IJAS examines Asia on a regional basis, emphasizing patterns and tendencies that go beyond the borders of individual countries. The editorial committee is particularly interested in interdisciplinary and comparative studies whose arguments are strengthened by rigorous historical analysis. The committee encourages submissions from Asian studies researchers globally, and especially welcomes the opportunity to introduce the work of Asian scholars to an English-language readership. Published in association with the Institute for Advanced Studies on Asia, University of Tokyo. Marriage and the Law in the Age of Khubilai Khan: Cases from the Yuan dianzhang By Bettine Birge. Cambridge, MA: Harvard University Press, 2017. Pp. 336. ISBN 10: 2016046674; ISBN 13: 978-0674975514. Science and Civilisation in China, vol. VI, Biology and Biological Technology, Part 4, Traditional Botany: an Ethnobotanical Approach By Georges Métailié. Cambridge: Cambridge University Press, 2015. Pp. xli + 748. ISBN 10: 1107109876; ISBN 13: 978-1107109872. Film Production and Consumption in Contemporary Taiwan: Cinema as a Sensory Circuit By Ya-Feng Mon. Amsterdam: Amsterdam University Press, 2016. Pp. 216. ISBN 10: 9089648887; ISBN 13: 9789089648884. Gurōbaru historī to Higashi Ajia-shi グローバルヒストリーと東アジア史 (Global History and East Asia) Edited by Haneda Masashi 羽田正. Tokyo: Tokyo Daigaku Shuppankai, 2016. Pp. 328. ISBN 10: 4130203037; ISBN 13: 978-4130203036. The End of National Cinema: Filipino Film at the Turn of the Century By Patrick Campos. Manila: University of the Philippines Press, 2016. Pp. 663. ISBN 10: 9715428223; ISBN 13: 978-9715428224. Revolutionary Nativism – Fascism and Culture in China 1925–1937 By Maggie Clinton. Durham: Duke University Press, 2017. Pp. xi + 268. ISBN 10: 0822363771; ISBN 13: 978-0822363774.